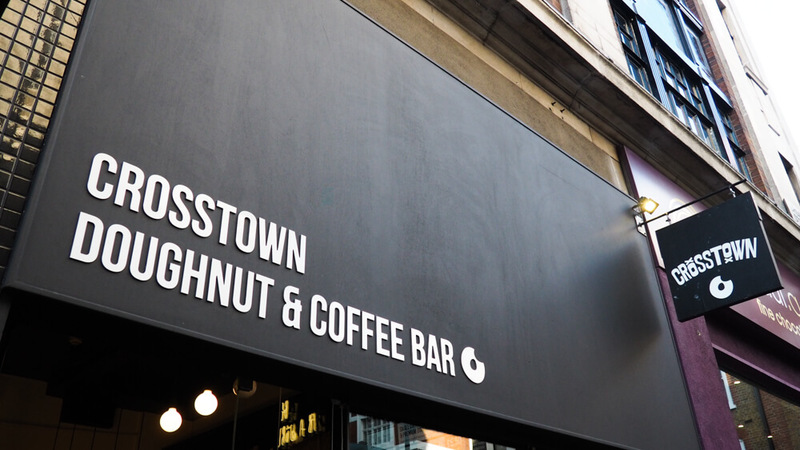 After wandering around London for hours, as you always find yourself doing in London, I was looking for a cup of coffee and a wee sit down when we came across Crosstown Doughnuts Soho way back in 2016. Doughnuts were never really my thing, so I wasn’t overjoyed at Peters suggestion to stop at Crosstown but a seat is a seat, so it didn’t take much persuasion. But I’m so glad that he did, as to this day we make a conscious effort to visit Crosstown Doughnuts whenever we’re in London. Theres no denying that I’m still very much a cake girl but as they say, variety is the spice of life! Crosstown Doughnuts are a scratch bakery. And what is a scratch baker? Well, to keep things simple, everything that can be done by hand is done by hand. They avoid using a batch mix where they can. They roll the dough by hand along with making the jams, fillings, glazes and everything else that they can in store. 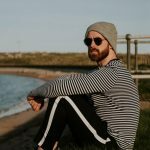 We often hear the phrase ‘quality over quantity’ and that’s what it boils down to. Crosstown don’t believe that you should sacrifice the quality of the product just to get more out the door by creating big batches of mix. One thing I have learnt and love is that Crosstown Doughnuts don’t just do their thing, but they move with the times. 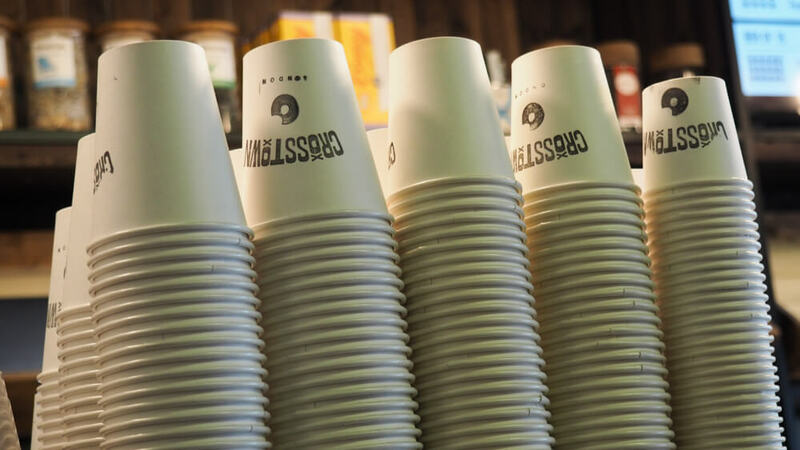 Not only do they use sustainably sourced packaging where they can and encourage recycling within their stores, but they remain inclusive of people. It’s silly that I even think that is such a great thing, when it should just be a given. But sadly, it’s more than often not and I think credit is due when people take the time to consider, plan and create for other people. Especially when they don’t have to, their products would sell regardless and it’s not done as an advertising gimmick. London is a big city as we all know, with a lot of different people and Crosstown Doughnuts have created doughnuts for the celebration of Canada Day, Independence Day but also to raise support for issues such as homelessness in the LGBQTI community. They create seasonal doughnuts along with the current festive selection. Hello crème brûlée! Or would I go for the gingerbread with cranberry compote? This is why I would suggest that you visit in groups..
And speaking of remaining inclusive, Crosstown offer a full vegan selection using only plant-based ingredients. 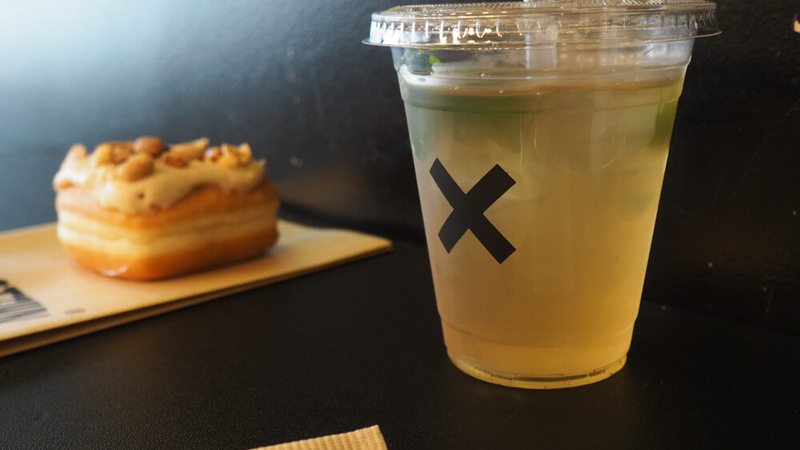 And even better than that, the Crosstown Marylebone is a dedicated vegan doughnut store served along with coffees and other hot drinks using dairy free alternatives. 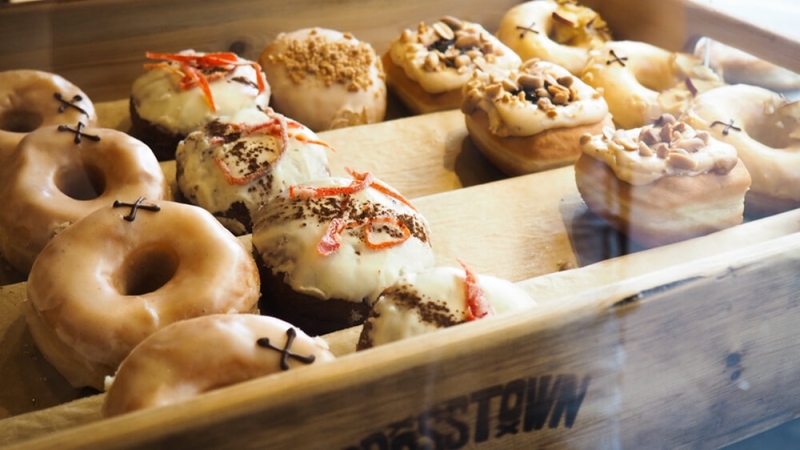 Well known for their hybrid signature yeast/sourdough base which is used to compliment flavours such as peanut butter berry, roasted peach, orange blossom and all the classics, Crosstown Doughnuts are definitely one to keep an eye on. Crosstown now have 14 locations to their name which also offer pickup and delivery services that can be placed through their website Crosstown Doughnuts. Tempted?